Ng Mui was one of the five legendary elders, one of the only five in all of China. Before the destruction of the Shaolin Temple in the Qing Dynasty of Ancient China there were many elders and she was one of them. After the Shaolin temple was betrayed, attacked and destroyed only a few lived to see tomorrow. Only five elders survived and Ng Mui was one of the survivors. The attackers were very aggressive and had no intentions of capture, they wanted all of the monks dead and gone for good. The five elders survived and were so known as the five legendary elders. In the legends of China Ng Mui was the daughter of a Ming general. She is known for inventing many different forms of Chinese Martial Arts. She is known for finding Wu Mei Pai, which is also known as Ng Mui style and this form of Chinese Martial Arts was named after. She is also credited with the invention of Wing Chun Kuen which is the style of kung-fu she passed on to Yim Wing Chun. 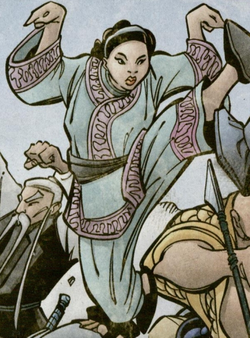 She was a snake and a crane fighting and so she incorporated their movements into a form of Martial Arts which could be used by humas to defend themselves.This form is known as Wing Chun because she passed it on to her disciple Yim Wing Chun and she was the very first master of the art Wing Chun. This form was passed on to Grand master Ip Man through out the centuries and eventually to action star Bruce lee and Ip Man's sons Ip Ching and Ip Chun. Ip Man's sons are still alive today in their 80s. She had also created The Dragon Style of kung-fu and Tibetan White Crane kung-fu. She had also invented the Five Pattern Hung Kuen which was the form of martial art which was taken after animal movements. All the attacks defenses, retreats, and counters were based on animals.